It's a crazy life living under the Big Top. Click here to play! Whether rain or shine, sickness or hospitalization - the show must go on! We have a bunch of incredible acts here at the Big Top. Would you like to take the tour? Well, first of all, we have our World Famous, One of a Kind, Stupendous Steve the Seal Show! The kids love to see him play with his rainbow beach ball, and Steve loves to see them smile. Isn't that right, Steve? ...I didn't know that seals had obscene gestures. You learn something new every day, don't you? Next up, Eli the Elephant will demonstrate his skill on a tricycle. How did we make an elephant sized tricycle, you ask? We didn't! Eli brought it with him when he joined the show. It's apparently been in the family for years. Don't ask how the family got it in the first place, but we're certainly glad to have Eli and his trike here as part of the Big Top family! Gregor the Clown is one of our biggest attractions, but the kids don't seem to laugh at him. Mostly they just stare at his frozen expression as he makes balloon animals and capers about. He pretends he made a face when the wind changed, so as not to scare the kids, but he actually fell face-first into a bucket of super glue one day. Tragic. Finally, our biggest attraction under the Big Top is Graham the Tiger Tamer. Not tiger-tamer. Graham is actually a tiger. We have him tame a wild Texan. It's absolutely surreal, I have to tell you, but people just can't get enough of it. Sold out show every night. Oops! Sorry, the show is about to start. Say, why not try out one of the great carnival games we have at the Big Top. We may be a small operation, but we still offer big prizes to people we like. We'll be leaving tomorrow, too, so you'll have to start playing tonight to have any chance at winning under the Big Top. 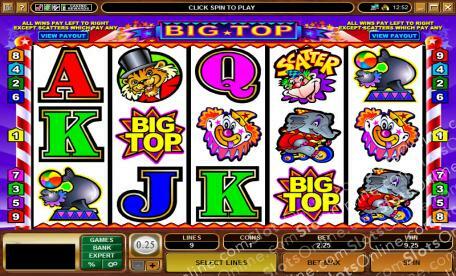 The Scatter Gorilla pays out big on the total bet when three or more appear onscreen. 3 scatter symbols win twice the total bet, 4 win 10 times the total bet, and 5 scatter symbols onscreen win 50 times the total amount wagered. Wild Clown symbols substitute for any symbol other than scatter symbols.